The settlement in Cambridgeshire, which had been buried for 3,000 years, was discovered when the tops of crude protest signs were spotted above layers of mud. Archaeologist Helen Archer said: “The signs, which include ‘Any old iron? NO THANKS,’ and ‘IRON? IR NO,’ a primitive attempt at wordplay, show that the residents were up in arms about climate-based migration patterns. 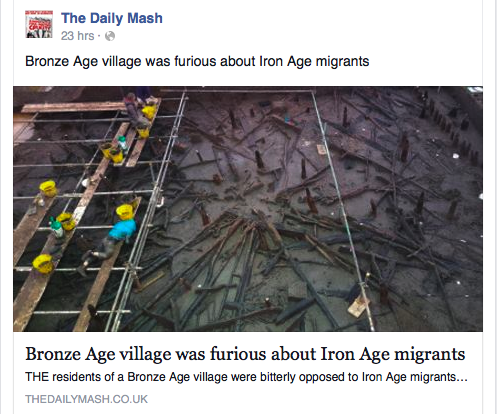 Note: The Daily Mash is a humor/satire site, similar to The Onion. Anyway, on to the genetics! Haak et al. made this graph, but I rearranged it so that the oldest samples are on the left and the newest ones are on the right. When multiple samples were about the same age, I ordered them from west to east (that is, from left to right as you look at a standard map. Unless you are in Australia.) I’ve added the dates (shown as ranges) that were in Haak’s paper. Note the asterisk under Karsdorf–those dates are still uncertain. The first three genomes are from super old skeletons found out in, like, Russia. I don’t know why they look so crazy–maybe because the DNA is really old and so not very good, or maybe because they actually had a bunch of different DNA in them, or maybe because they’re ancestral to a bunch of different groups. I don’t know! Luckily, it doesn’t really matter for today’s post, so I’ll investigate them later. And then some new guys showed up: Farmers. 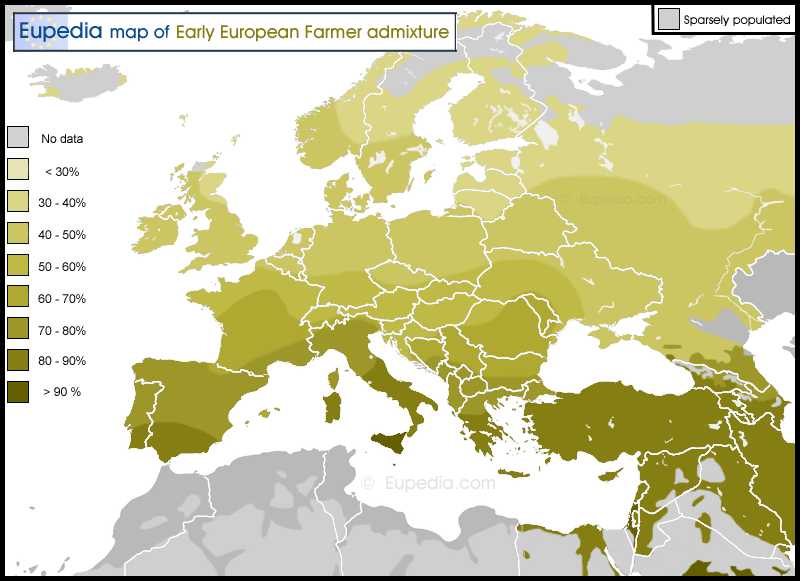 Known as the Early Eurasian Farmers (EEF,) they first appear on our graph in Starcevo, Serbia, their DNA in orange. They came from the Middle East (the birthplace of agriculture,) bringing their wheat, permanent settlements, and livestock. 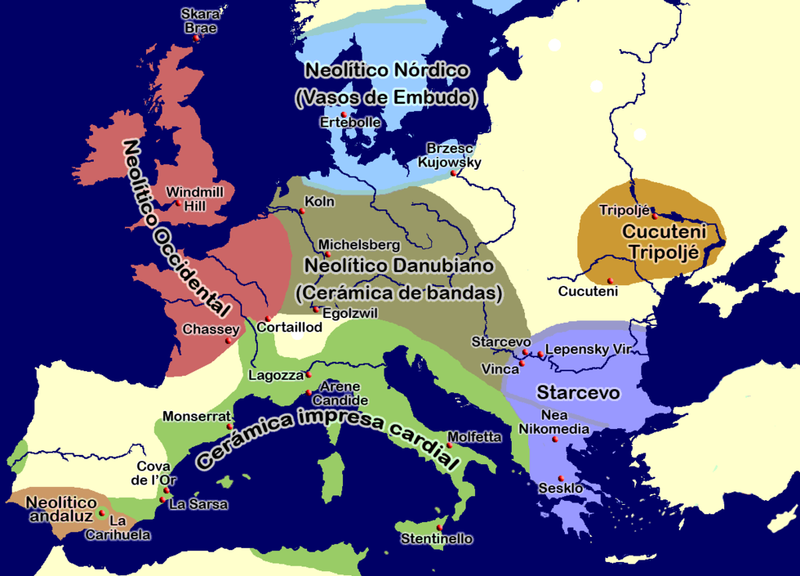 Neolithic cultures of Europe–Starcevo is i the lower right-hand corner. But to the east, out on the Eurasian steppes, the hunter-gatherers lived on. The steppes are known more for their rampaging hordes than their farmers, and this is exactly what they became. The Yamnaya, as we now call them, are about half WHG and half some new population (I call them the Teal People.) As far as I know, no “pure” teal people have yet been found, but teal DNA is all over the place, from India to Spain. The Yamnaya are also known as the Proto-Indo-Europeans–the guys who spoke the language ancestral to all of today’s Indo-European languages. And like all conquering barbarian hordes, they expanded out of their homeland in present-day southern Russia (north of the Caucuses,) and conquered everything in their path. If we didn’t have the ancient DNA–or if we had less of it–it would be easy to think that the Blue component in modern Europeans had come directly from the ancient WHG population that lived in their particular area. Instead, much (if not most) of the modern “blue” component hails from the steppes of Russia–a remarkable comeback for the WHGs. Oh, and the “indigenous” people of Europe? They’re all indigenous to the continent. Otzi ate grain but was lactose intolerant. Haplogroup G2a(SNP P15+) has been identified in neolithic human remains in Europe dating between 5000-3000BC. 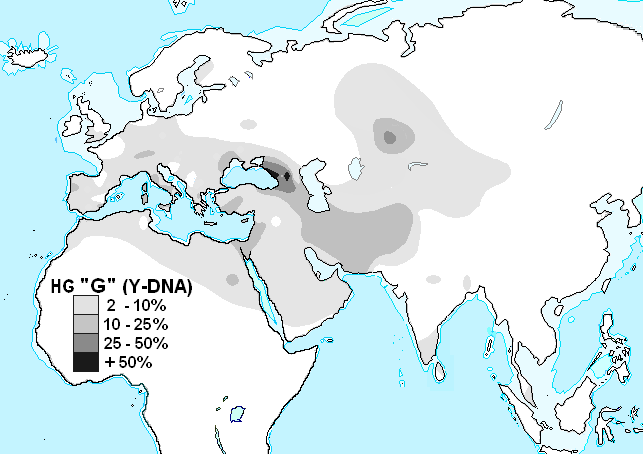 Furthermore, the majority of all the male skeletons from the European Neolithic period have so far yielded Y-DNA belonging to this haplogroup. The oldest skeletons confirmed by ancient DNA testing as carrying haplogroup G2a were five found in the Avellaner cave burial site for farmers in northeastern Spain and were dated by radiocarbon dating to about 7000 years ago. At the Neolithic cemetery of Derenburg Meerenstieg II, north central Germany, with burial artifacts belonging to the Linear Pottery culture, known in German as Linearbandkeramik (LBK). This skeleton could not be dated by radiocarbon dating, but other skeletons there were dated to between 5,100 and 6,100 years old. The most detailed SNP mutation identified was S126 (L30), which defines G2a3. G2a was found also in 20 out of 22 samples of ancient Y-DNA from Treilles, the type-site of a Late Neolithic group of farmers in the South of France, dated to about 5000 years ago. The fourth site also from the same period is the Ötztal of the Italian Alps where the mummified remains of Ötzi the Iceman were discovered. Preliminary word is that the Iceman belongs to haplogroup G2a2b  (earlier called G2a4). By autosomal DNA he is most closely related to southern Europeans, especially to the geographically isolated populations of the two Mediterranean islands of Sardinia and Corsica. … In October 2013, it was reported that 19 modern Tyrolean men were related to Ötzi. Scientists from the Institute of Legal Medicine at Innsbruck Medical University had analysed the DNA of over 3,700 Tyrolean male blood donors and found 19 who shared a particular genetic mutation with the 5,300-year-old man, which led them to identify the link. The Great Hungarian Plain was a crossroads of cultural transformations that have shaped European prehistory. 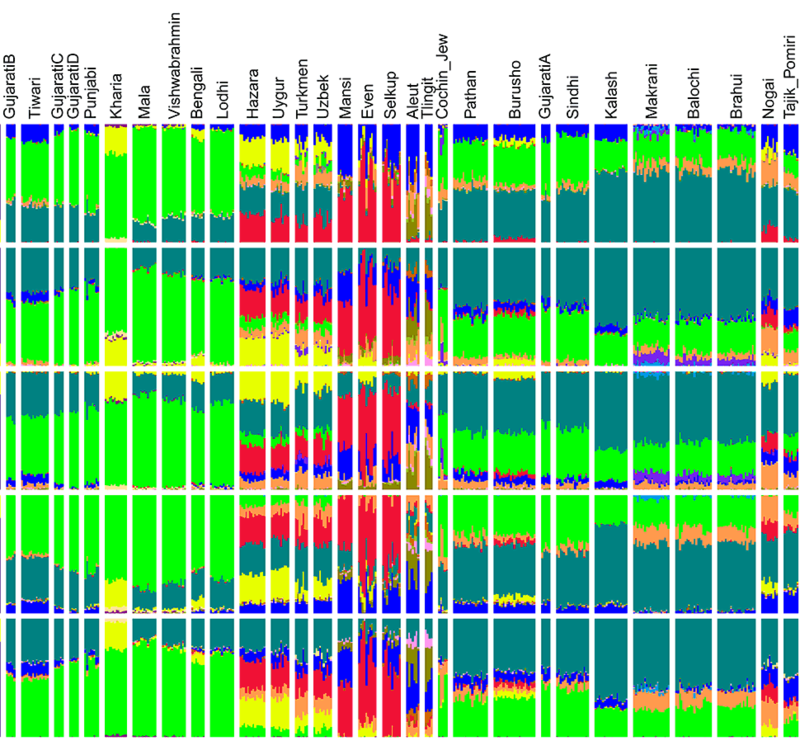 Here we analyse a 5,000-year transect of human genomes, sampled from petrous bones giving consistently excellent endogenous DNA yields, from 13 Hungarian Neolithic, Copper, Bronze and Iron Age burials including two to high (~22 × ) and seven to ~1 × coverage, to investigate the impact of these on Europe’s genetic landscape. These data suggest genomic shifts with the advent of the Neolithic, Bronze and Iron Ages, with interleaved periods of genome stability. 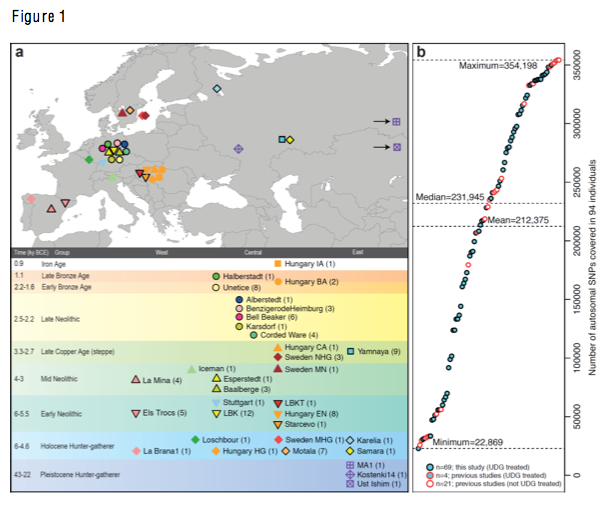 The earliest Neolithic context genome shows a European hunter-gatherer genetic signature and a restricted ancestral population size, suggesting direct contact between cultures after the arrival of the first farmers into Europe. 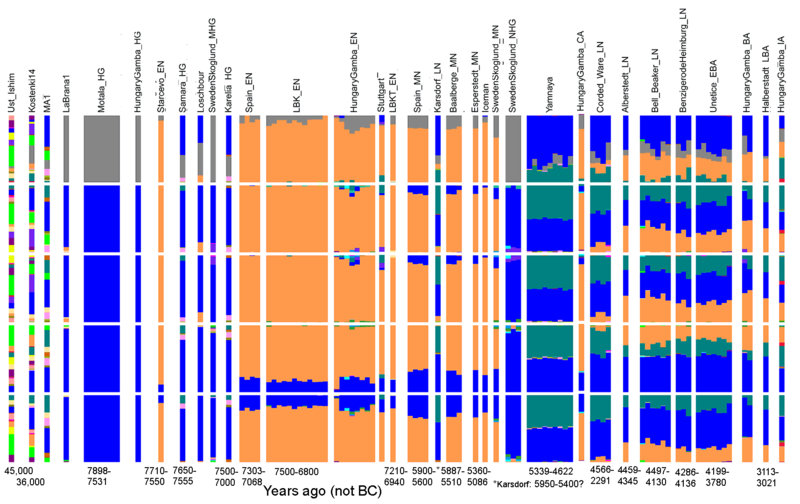 The latest, Iron Age, sample reveals an eastern genomic influence concordant with introduced Steppe burial rites. We observe transition towards lighter pigmentation and surprisingly, no Neolithic presence of lactase persistence. 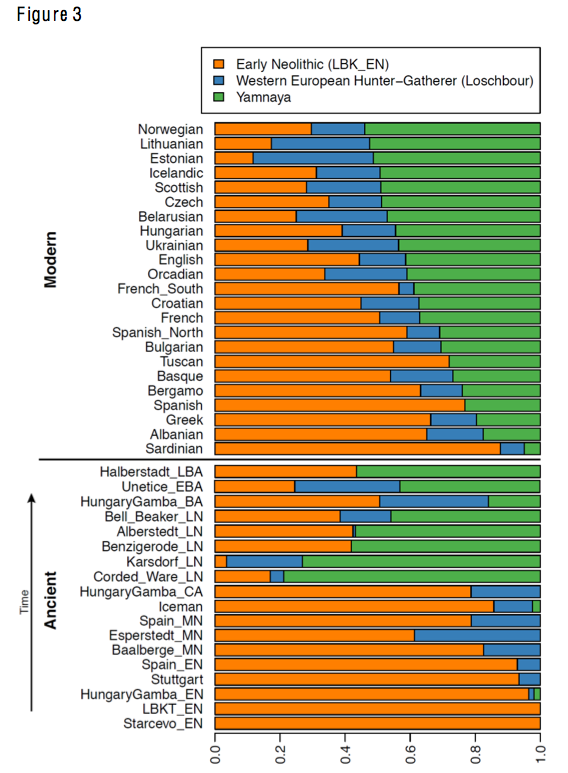 Iosif Lazaridis et al’s model of modern European genetic origins. Analysis of ancient DNA can reveal historical events that are difficult to discern through study of present-day individuals. 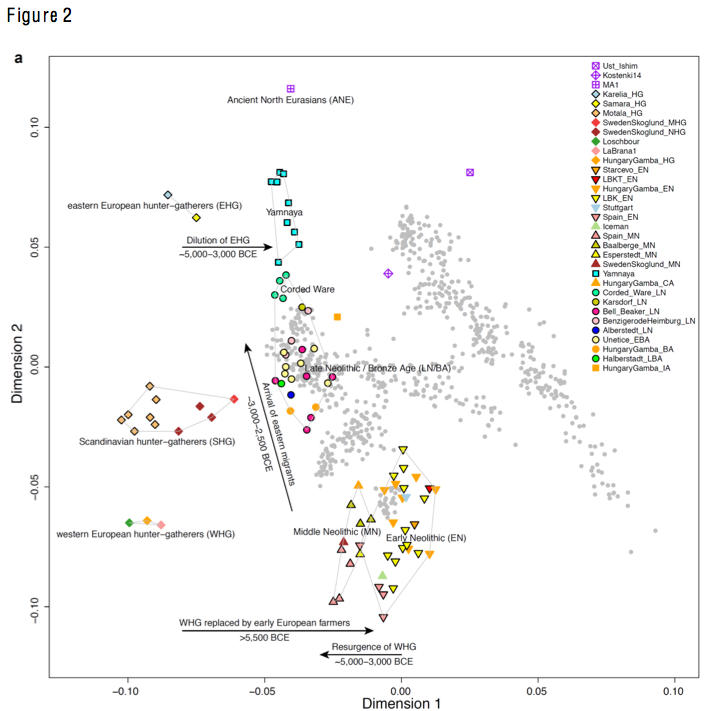 To investigate European population history around the time of the agricultural transition, we sequenced complete genomes from a ~7,500 year old early farmer from the Linearbandkeramik (LBK) culture from Stuttgart in Germany and an ~8,000 year old hunter-gatherer from the Loschbour rock shelter in Luxembourg. 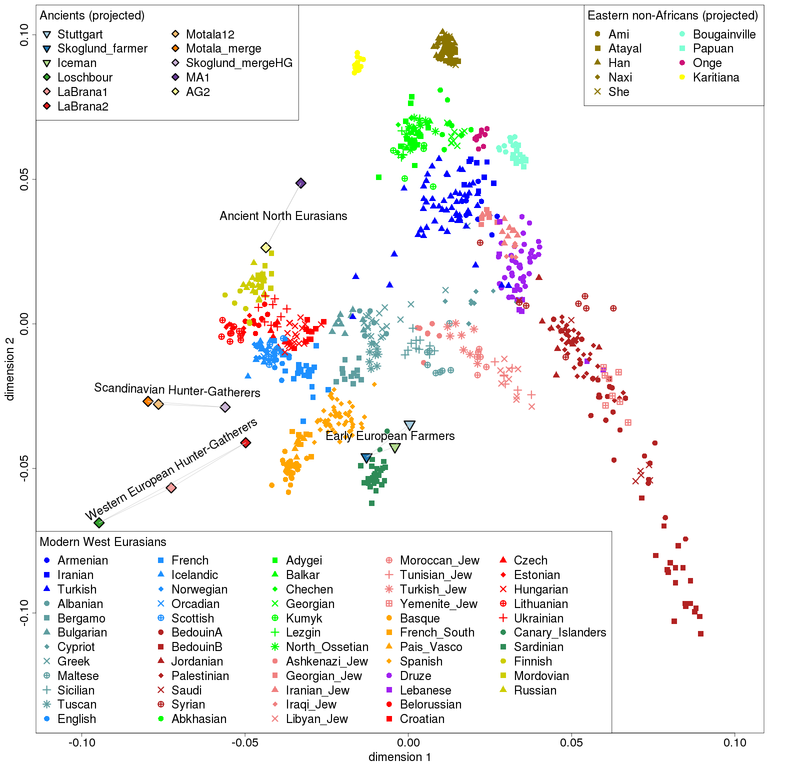 We also generated data from seven ~8,000 year old hunter-gatherers from Motala in Sweden. 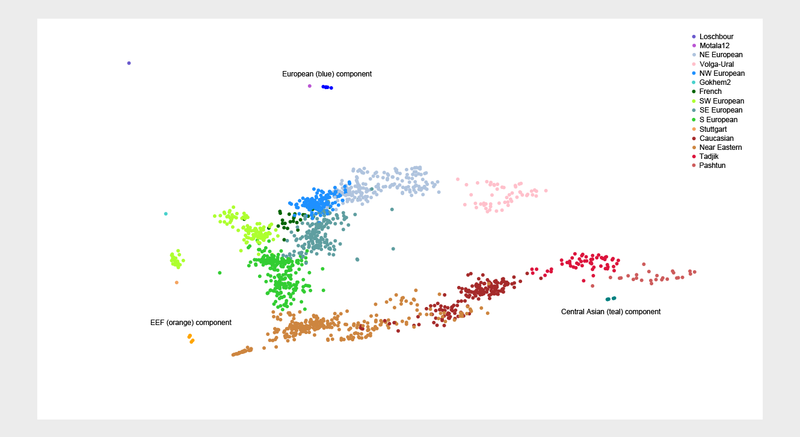 We compared these genomes and published ancient DNA to new data from 2,196 samples from 185 diverse populations to show that at least three ancestral groups contributed to present-day Europeans. 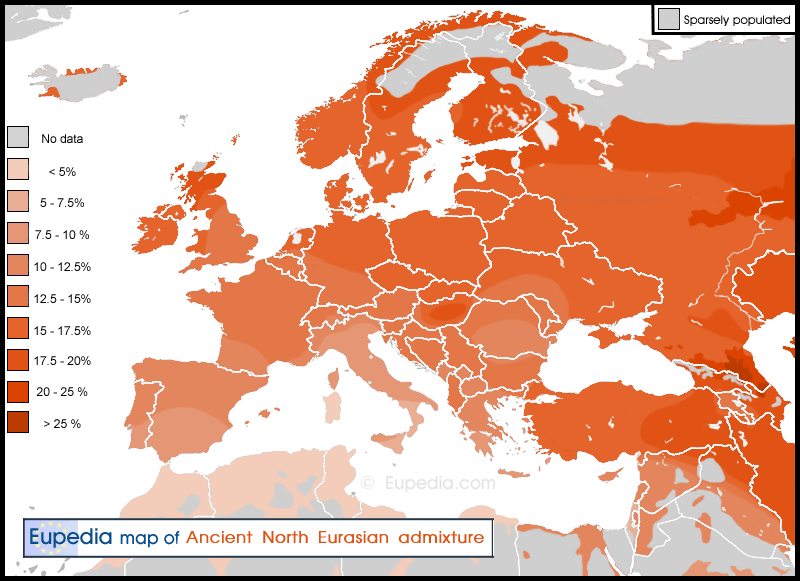 The first are Ancient North Eurasians (ANE), who are more closely related to Upper Paleolithic Siberians than to any present-day population. 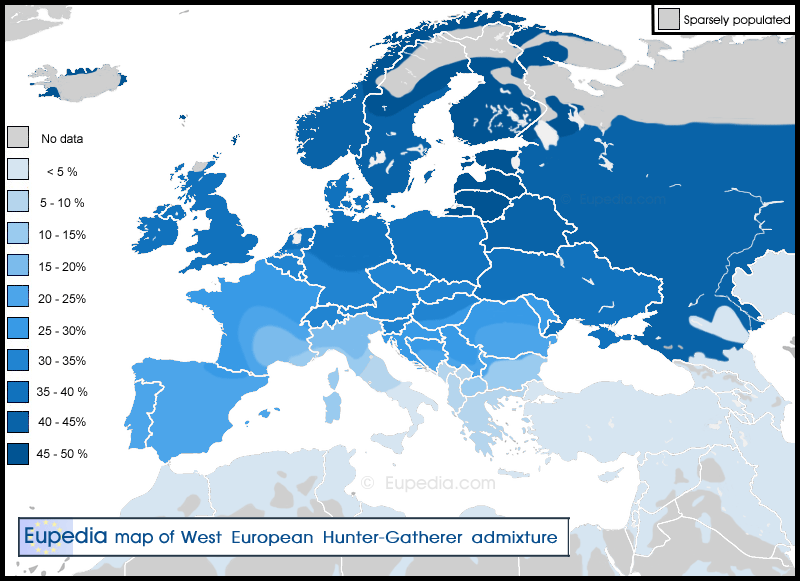 The second are West European Hunter-Gatherers (WHG), related to the Loschbour individual, who contributed to all Europeans but not to Near Easterners. The third are Early European Farmers (EEF), related to the Stuttgart individual, who were mainly of Near Eastern origin but also harbored WHG-related ancestry. 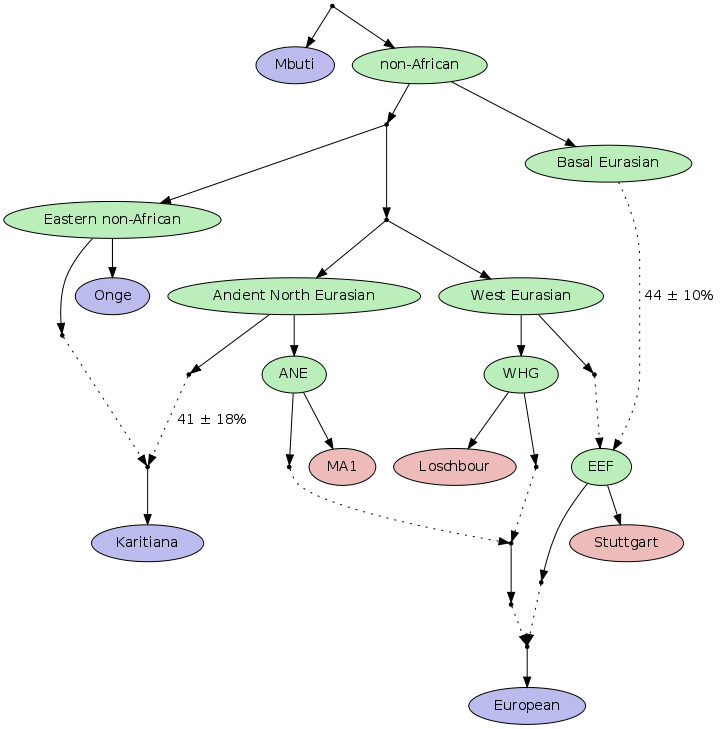 We model the deep relationships of these populations and show that about ~44% of the ancestry of EEF derived from a basal Eurasian lineage that split prior to the separation of other non-Africans. I’m sorry, I forgot where this came from. 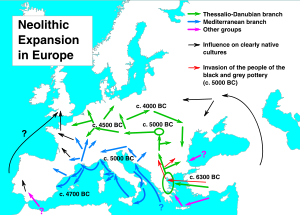 British population history has been shaped by a series of immigrations, including the early Anglo-Saxon migrations after 400 CE. … Here, we present whole-genome sequences from 10 individuals excavated close to Cambridge in the East of England, ranging from the late Iron Age to the middle Anglo-Saxon period. … we estimate that on average the contemporary East English population derives 38% of its ancestry from Anglo-Saxon migrations. … Using rarecoal we find that the Anglo-Saxon samples are closely related to modern Dutch and Danish populations, while the Iron Age samples share ancestors with multiple Northern European populations including Britain. Interesting how the North-South cultural and linguistic gap in Italy is also mirrored genetically, with a set of lines coinciding almost perfectly with historical borders. In retrospect it shouldn’t come as a shock- I know an individual of Northern-Italian descent who once complained to me that everyone kept telling him he didn’t look “Italian”- which in my area, mostly means Sicilian or Calabrian. Even in Australia, we put north at the top of our maps. Of course, this means we have the equator (the wide bit) near the top of our continental maps, tapering off towards the south pole (the narrow bit) at the bottom. This is in contrast to those in Europe, Asia or NA who have the equator at the bottom and taper off towards the north pole at the top. Which is why we in the southern hemisphere have fat heads, while you northerners have fat bottoms. There are some novelty “upside down” maps about. They are mostly sold in tourist and novelty shops down under. I own a Wizard of Christchurch (New Zealand) map which follows this trope. But more authoritative maps and atlases from those countries follow the traditional northup convention.